Get ready for a new show experience with an expanded NAMM Campus. The 2018 NAMM Show will offer an enhanced show experience for all exhibitors and attendees —with more room for exhibit, educational and community areas as we unite the world’s music products, pro audio, live sound, lighting and entertainment technology communities. Using best practices from urban planning models and working collaboratively with NAMM members we will utilize this opportunity to introduce new benefits across the expanded NAMM Campus. The expansion of the Anaheim Convention Center enables The NAMM Campus to grow, offering us new ways to showcase our members' products, provide the best in professional education and host networking opportunities that connect NAMM's many communities. The new ACC North Hall will showcase two connected levels, expanding the size of The NAMM Campus by 20%. The new ACC North Hall will seamlessly integrate in to The NAMM Campus and two levels will be connected by escalator sets. 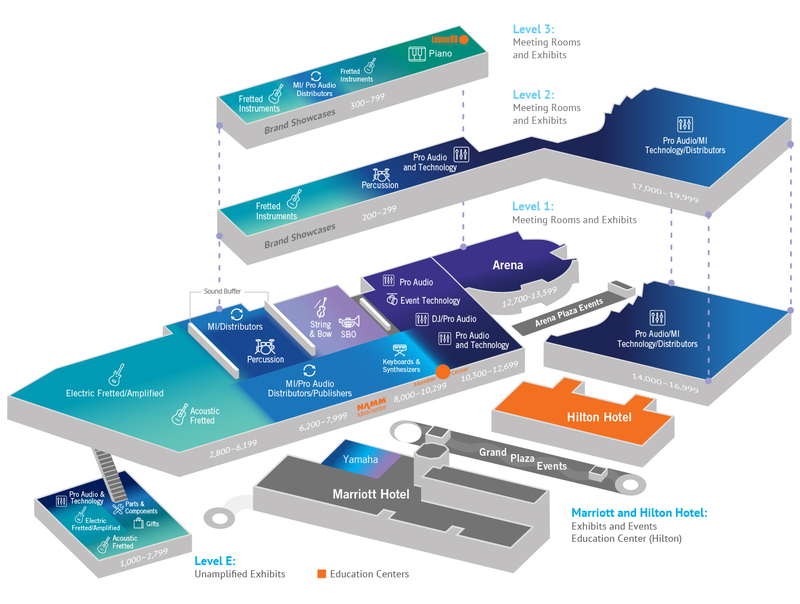 The second level will be joined to the current Convention Center by a sky bridge connection, expanding our stable business platform with 20% more multi-use space. An enhanced show experience across the entire NAMM Campus. The expanded NAMM Campus will provide the backdrop to create new on-floor experiences, festival opportunities, community thought centers, demo and meeting areas, while offering wider aisles, minimizing congestion, and providing transition zones between exhibit areas. The added space also enables us to offer more amenities and food choices and allow for the growth of all segments of the global NAMM community. Artist renderings showcase a beautiful new complex to welcome NAMM members. New benefits for the NAMM Show community. Once complete, the newly expanded Anaheim Convention Center will be one of the most modern trade show facilities in the world, offering a variety of new benefits to NAMM Show exhibitors and attendees. Construction of foundation, loading docks and connector bridge begins. The project starts to go vertical with the concrete parking structure and structural steel supports. Guests will start parking in part of the new 1,350-space parking structure and access the existing Convention Center through the air conditioned bridge concourse. Guests will start parking in 600 of the new 1,350-space parking structure. The building is weather proofed, the interior walls are finished, and exterior landscaping begins. Project is completed delivering new multipurpose space to the City of Anaheim. The 2018 NAMM Show will present a new experience across the expanded NAMM Campus. NAMM is undertaking an industry wide collaborative process on how to utilize the expanded campus. The NAMM Show is a business ecosystem like no other, uniting the world’s music products, pro audio, live sound, lighting and entertainment technology communities who share a passion for music and sound production. We look forward to hearing your ideas on how to best utilize this new space to create a show experience that can help to drive your business, and our industry, forward in 2018—and for years to come. Over the course of the coming months, and by The 2017 NAMM Show, we will see major progress on the new ACC North Hall, which has an estimated completion date of Spring 2017.